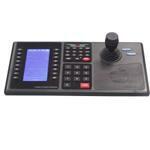 PE512X universal CCTV keyboard controller - CCTV - PEARMAIN Electronics (Hangzhou) Co., Ltd. Supplier: PEARMAIN Electronics (Hangzhou) Co., Ltd.
PE512X series is Universal keyboard to Matrix switcher, DVR and pan-tilt (speed dome), to offer system program, switch & pan-tilt and lens control, etc. function, with Pelco, Samsung, etc. protocol, to make PE512X can be compatible to popular platform. With Marco function, multi-function keys, also it can determine keys according to practice, it can upload and program firmware of Marco and other function key from PC directly. PE512X can receive alarm information from matrix to trigger other auxiliary operation or relay. 3 communication ports to have RS485/RS422/RS232, baud rate can set. With 10M/100M Ethernet port optional. Operation keys display on 240x128mm LCD by icon. LCD indicate system status, operation success indicator, with several tone available, volume can set.